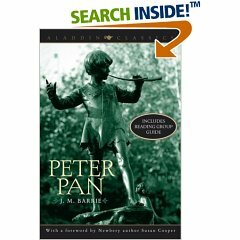 A quick note on Peter Pan. I had never read it before. I grew up with the "Disney Classic", of course. Earlier this year my husband and I were able to take in the traveling Broadway performance starring Cathy Rigby which was loads of fun. I was somewhat taken aback by several things about the book. Tinkerbell, for instance, has something of a foul mouth. Peter is, at times, ABSOLUTELY insufferable. I still don't like Mr. Darling. I was tempted to write a completely scathing review. Then I thought about it. Disney took this story and cleaned it up to make it more palatable and clean as they have done with so many classic stories. For instance there's the tale of Cinderella. Disney doesn't include heels and toes being cut off and shoes being soaked in blood in order to obtain the handsome prince. We are more content and happy with Disneyfied tales. But a lot of original stories are more gory and intricate than Disney would lead the modern generation to believe. Yeah, I think some things are too disturbing at times to be included in children's tales. Particularly on the big screen where vivid pictures can create lasting and difficult-to-deal-with images in children's minds. There's a time and a place for everything. The long and short of it is - I decided that I didn't like Peter Pan because I like Disney too much. And sometimes Disney isn't real and doesn't tell the story as it was meant to be told. We lose both good and bad details whenever a story is taken to film. That's just the way it is. I can't say that my opinion of any of the characters in Peter Pan have necessarily changed since reading the book. It wasn't what I expected. But I'm glad I read it and if you are interested in reading the original Grimm's Fairy Tales then I would harbor no objection to the reading of the true tale of Peter Pan. To object to Barrie but not the Brothers Grimm is too contradictory in my mind. So enjoy Peter for what he's worth! I'll figure out how to filter the story for our kids for awhile but would eventually encourage them to find out what "really" happened. Meanwhile, I'm MOST interested to read the newly released sequel to Peter Pan by Geraldine McCaughrean entitled Peter Pan in Scarlett. (If anyone out there has read it already, I would love to hear your opinion.) I typically hate sequels written by other authors and expect no less from this book. But curiosity compels. I've heard that about the Barrie classic before, never read it to check it out myself. The newer book sounds interesting. After just reading your post over at LLAN, I decided to see if you had read this one. It seems we pretty well had the same thoughts on it. Now I'll have to go through more of your old reviews to see if I need to mark anymore off my list.